Every so often I come across a client that is petrified of the stock market. Every dollar of their savings is held in an FDIC insured savings account, and the mere thought of using bonds and equities to preserve buying power and build wealth brings a nervous frown to their face. Little do they know of the damage this is doing to their chances of ever retiring comfortably. This post is not another future value calculation of your savings after 30 years with an account yielding ___ vs. and account yielding ___ . What I would like to do is encourage you to make increasing your savings rate into 401k and IRAs THE priority for your finances. 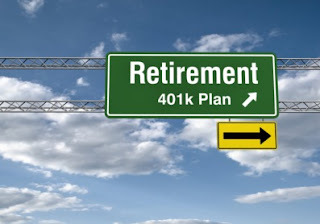 There is a lot of debate among personal finance experts on whether to put excess funds toward your mortgage principle or invest, but I must shift from a recommendation I made in a previous post to suggest that excess funds be put toward maxing retirement space. How Do I Max Retirement Accounts? Listen, if you can't you can't. But start somewhere. For example, my wife and I have a mortgage payment and HOA payment totaling $1200 combined. We are able to get the full employer match, (5% of my salary) max 1 ROTH ($458.33/month) and put $200 into a second ROTH. My wife's employer does not offer a 401k, so we are making it our goal to max her IRA annually by next year. This leaves my 401k as the last retirement account, and to max this out I'd need to put an extra $1,241.67 into it a month. HOWEVER, we do know that should our income increase, our expenses decrease, or we get some unexpected excess funds, this is where the funds would go. Ultimately, I feel that the 4% guaranteed return I could get by paying down our mortgage principle does not stack up to the expected 8% tax advantaged return I feel we'd earn on our retirement accounts. Listen, if someone wants to put excess funds toward their mortgage principle, MORE POWER TO THEM! Everyone's situation is different. Income levels, tax brackets, and mortgage rates all play a part in this decision. But FOR ME AND MY HOUSE... We will fund retirement.